Stefanowski's last employer is barred here. Does it matter? One stop stands apart in Bob Stefanowski’s trip through the top ranks of global finance. His last job in the private sector was running a payday loan company whose short-term, high-interest loans are barred by usury laws in at least a dozen states — including the one where he is the Republican nominee for governor, Connecticut. Stefanowski was the chief executive officer of DFC Global. Before he took over in mid-2014, the company engaged in what regulators on both sides of the Atlantic called predatory lending and collection practices, some involving fraudulent car loans to U.S. military personnel. Its other businesses included pawn shops and check cashing stores geared to the poor. It was a down-market departure for Stefanowski, who was a 52-year-old expatriate living in London when he took the job. 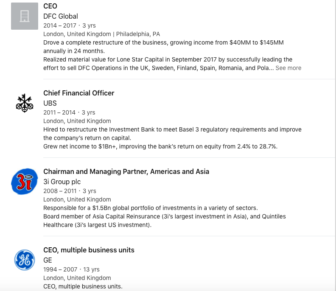 He had a blue-chip resume with 13 years at GE in the U.S. and overseas, then three-year tours at a London-based international equities firm, 3i, and UBS Investment Bank. In a video of the conference available on YouTube, Stefanowski argues there is a way to turn a profit loaning money to people with bad credit without exploiting them, as DFC repeatedly did in the U.S. and U.K. It is an assertion that resonates with some independent researchers and consumer advocates familiar with the field, though hardly all. In two-and-a-half years at DFC, Stefanowski cleaned house, bringing in socially-minded executives like Luz Urrutia. She co-founded a bank geared to serving minorities and had developed a broad network of academics, consumer advocates and industry executives interested in finding that elusive sweet spot in subprime lending: How to make money off the poor without simultaneously ripping them off. Stefanowski’s conduct at DFC has been less of an issue in his campaign for governor than the simple fact he took the job. Political campaigns offer few opportunities for nuance, but Stefanowski’s role at DFC raises questions that defy facile answers. Among them: What does it mean to be a change agent in a business whose main product is universally reviled and actually a crime to offer in Connecticut? Urrutia is now the chief executive at the Opportunity Fund, a non-profit provider of micro loans. Its mission includes educating consumers about the pitfalls of so-called “alternative financial services” such as payday loans. She also is one of nine members of the Consumer Advisory Board to the federal Consumer Financial Protection Bureau, an agency with an uncertain future since the election of Donald J. Trump. She said her willingness to work for a payday lender stunned many of her friends in the financial world. Urrutia said she saw DFC, one of the largest providers of payday loans in the world, as the ideal place to experiment with how to better serve a market of 50 million Americans for whom credit cards and other conventional financial tools are unavailable. The experiment — which would prove to be short lived — involved offering installment loans that are inherently less abusive than payday loans, but can still be expensive. But DFC never stopped offering payday loans, and Stefanowski insists to this day they can be a responsible form of doing business, despite the industry’s poor record. He would not, however, suggest Connecticut legalize them, nor does he defend the industry in general. “I’m not advocating anything like what payday lenders have done historically,” Stefanowski told the CT Mirror in a series of interviews. He offered no opinion of Connecticut’s lending laws. In theory, payday loans are an affordable solution for millions of Americans who lack the financial reserves to handle an unexpected expense, such as a car repair that might mean the difference between keeping a job and losing it. A $200 loan from one of DFC’s Money Mart stores in California costs $35.29, assuming full repayment in two weeks. On an annual basis, that’s an interest rate of 460 percent. But the practice is far different. A majority of loans, according to studies, including a household survey commissioned by the FDIC, are taken for household expenses, not one-time, extraordinary events. “Bob’s vision was to help transform the industry, to provide responsible lending services for consumers that need a lot of help. For a period of time, we were really changing a lot of what we were doing. One loan leads to another, rapidly running up fees and interest costs. The Center for Responsible Lending concluded in one study that 76 percent of payday loans are the result of “churning,” the practice of taking out a new loan within the same two-week period as closing out an old loan. Peterson said that is why the loans DFC made before, during, and after Stefanowski’s tenure were not offered in Connecticut. The company Stefanowski took over in 2014 was a pioneer in payday lending, founded in 1990 by Jeffrey A. Weiss, who eventually took the company public. Filings with the U.S Securities Exchange Commission show Weiss made $5 million a year, and that he convinced his board to grant him a lifetime annual income of $300,000 should he retire or be dismissed. His other compensation, ironically enough, included low-interest loans. The market changed dramatically in the months leading to the sale of DFC for $1.3 billion to Lone Star Funds, an investment group headed by John Grayken, a reclusive billionaire who went on a shopping spree of distressed properties after the financial collapse in 2008. Financial regulators in the U.K. accused DFC of making loans without regard to its customers’ ability to pay. In the U.S., the new Consumer Finance Protection Bureau, which was authorized by the Dodd-Frank Wall Street Reform and Consumer Protection Act of 2010, also was looking to tighten the rules for payday lenders. Against that backdrop, Lone Star went looking for a new CEO to oversee DFC, a company based in Malvern, Pa. that did most of its business in the U.K and Europe. “And they lived up to that,” he said. Stefanowski said he replaced 28 of the top 30 executives and declined the Porsche the company leased for Weiss, as well as its reserved parking spot by the front door. Told that DFC was committed to a three-year lease on the car, he said, he raffled off use of the car at a company Christmas party. 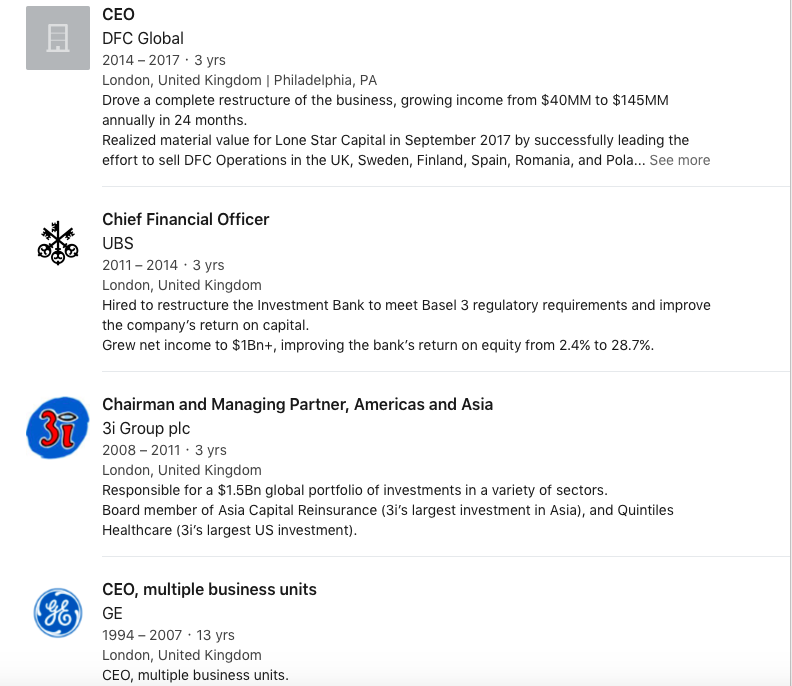 His recruits included a former GE Capital colleague, Roger Favano, who became chief financial officer, and Urrutia. Both left the company in 2017 after Stefanowski stepped down as CEO. Favano did not return calls for comment. “This may sound like I’m bragging, but it has the benefit of being true: A lot of people wouldn’t touch this industry until they met with me,” Stefanowski said. In November 2016, he participated in two meetings in Washington about the state of the industry — one the public conference sponsored by the Committee for Economic Development of the Conference Board a week after the election, the other a private talk Urrutia had arranged with her network of industry observers and critics. At the public meeting, Stefanowski dismissed a suggestion that the industry could relax after Trump’s victory, even though the questioner was correct in assuming that the new administration would be hostile to the CFPB, whose creation was inspired in part by Sen. Elizabeth Warren of Massachusetts. “When I meet with the regulators, and I mean it, our interests are perfectly aligned. I don’t want to do bad things to people,” he said. “We had a bond holder call the other day, and the first question was, ‘Trump’s going to get rid of the CFPB. How does that change your strategy?’ I said it doesn’t change it one iota. CT Mirror reached two participants of the private meeting, both non-profit employees with deep knowledge of the payday industry who often act as critics. Neither would be quoted for the record, saying they were reluctant to be involved even tangentially in a political campaign. One person said his employer prohibited commenting in political stories close to an election. They offered similar impressions of Stefanowski, saying he seemed genuinely interested in finding more responsible ways of doing business, though one also noted it came as the industry was under pressure to make changes. Still, both said, the session was unusual for both the breadth of its participants and its free-wheeling nature. Participants said the discussion carried on for at least half a day, maybe longer. The company already had rolled out a new product in California and Canada, a three-year installment loan for customers with less than-perfect-credit histories. Installment loans, whose interest and fees are spread over the life of a loan, have a better record of repayment. With payday loans, costs are front-loaded. From DFC’s Money Mart web page. The new product, nonetheless, was expensive — with an annual percentage rate of nearly 60 percent. It is still offered by DFC’s Money Mart. Urrutia said the meeting was evidence of a desire by Stefanowski to bring further changes to the industry. State Rep. Bill Simanski of Granby, the ranking Republican on the legislature’s Banks Committee, signed a bipartisan letter urging the CFPB to crack down on payday lenders in 2016. Simanski has an open mind today about Stefanowski and how he ran DFC. Rep. Matt Lesser, the Democratic co-chair of the committee does not, however, saying even the new products still struck him as exploitative — and still barred by Connecticut law. 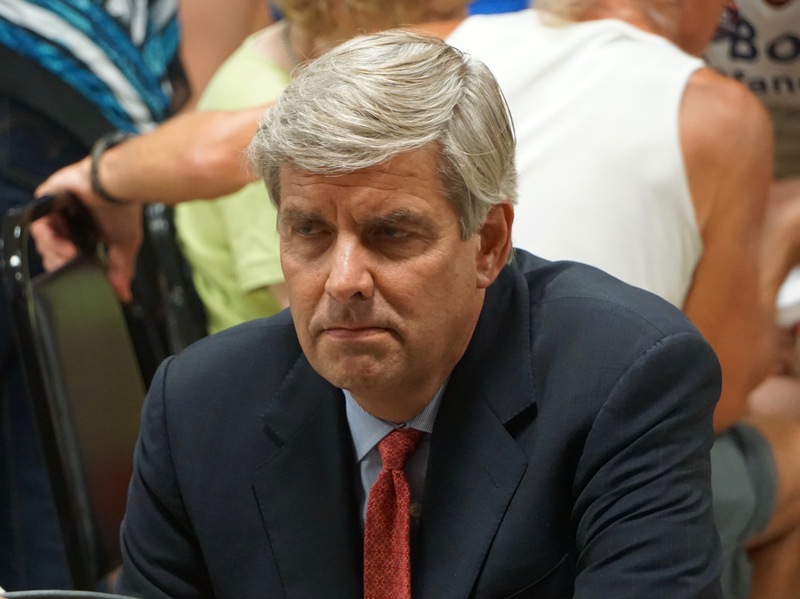 How far Stefanowski was wiling to go to change DFC is unclear. Two months after the meetings in Washington, he walked into Urrutia’s office and stunned her with the news he was leaving the company. She said he did not tell her why. 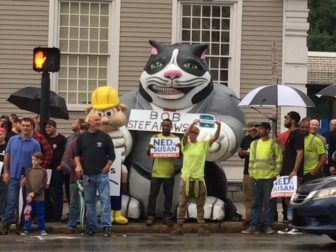 Unions tried to portray Stefanowski as a fat cat. Lone Star offered no comment in announcing his departure. Stefanowski, who has spent at least $2.6 million of his own money on his campaign, left without another job. His compensation was not public, and Stefanowski has declined to follow the political custom of releasing his tax returns. He says his departure was the result of the company’s shift in focus to the U.S. from the British and European markets he knew so well. Those properties were sold off, a task he carried out during the rest of 2017. Stefanowski said during the panel discussion in Washington two years ago that DFC Global was on the right track after his new hires, though his involvement in the industry might be dangerous to his career. He noted he was a family man, the father of three daughters, the youngest of whom is 15. The only job he is known to have sought since departing DFC is governor of Connecticut.